Cascadia Day is a day chosen to join together to help celebrate and raise awareness of Cascadia, meet our neighbors, and discuss and plan how we are going to positively create change here in the Pacific Northwest. Block parties, potlucks, movie nights, neighborhood cleanups, barbecues, tree plantings, wine tastings, wheat-pasting, pub nights, etc. Join or host an event that you feel would represent Cascadia. Help us make Cascadia Day an annual reality! Raise your flag, wear your patch, and join hundreds of other Cascadians for neighborhood events throughout the region, building Cascadia as a positive force for change. 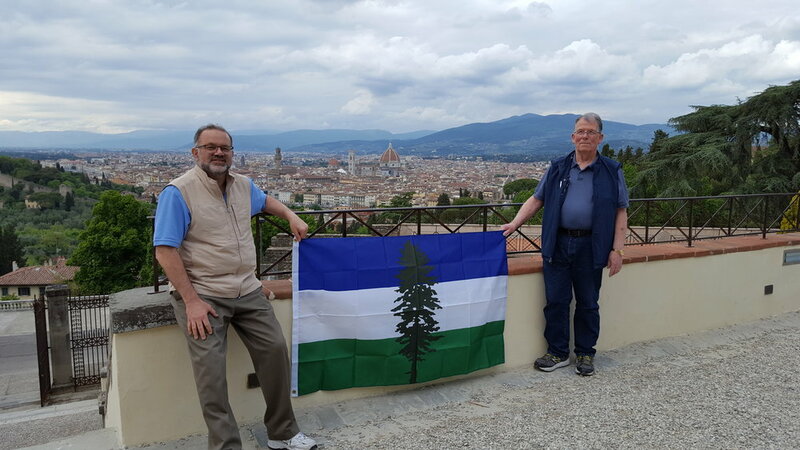 Even if you can’t join an event, think of something distinctly Cascadia you or your friends can do. Fly your flag & wear your swag! Host a flag waving party, or help print out & put up posters, reach out to businesses and share in your neighborhood. Share Cascadia. Share your favorite Cascadian photographs, images, posters on social media, raise awawreness and educate friends, and make sure to tag @Cascadianow! #CascadiaNow #CascadiaCW during the week. If you’re a facebooker, feel free to use this great Cascadia flag overlay for your profile to help raise awareness. Shop & eat locally. Use the week as an opportunity to share your favorite local businesses, restaurants, organizations, and businesses to friends and family. Do your shopping at a farmers market, cook meals using local ingredients, and have a great week knowing you are supporting your friends, family, neighborhood, and community, all in way which helps shift our actions to a bioregional model. Volunteer. Hook in with an amazing cause or organization you feel represents Cascadian values in your neighborhood or city. Get political. Write or call your representatives to see how they feel on Cascadia. Do a bit of research, write a card, give them a call and let them know whether you think they are doing a good job, or bad job – and how they stand about issues you care about. Get outdoors. Go for a hike, pull some invasive species, plant native plants, and celebrate this amazing bioregion. Go on a Cascadia photoshoot to capture the essence of what Cascadia means to you. Create an art project. Cascadia is a #DIY movement! Create or host a Cascadia art party that helps represent the things that are special. Learn about Bioregionalism or Cascadia by checking out some of the awesome books and articles on our reading list here! Or take the next step and host a reading group or book club! Make sure to share by tagging @cascadianow on FB, Instagram, Twitter, Tumblr or elsewhere. #Cascadia #CascadiaNow #CascadiaCW. Also feel free to share pictures, ideas, and events to morgan@cascadianow.org. May 18th is the anniversary of the Mt. St. Helens eruption, chosen by former Seattle University professor David McCloskey as a day to represent Cascadia because of it’s visceral reminder of the dynamism of our region. We live under massive forces that shape our world, in a region defined through it’s geography, geology and topography – and we are all a part of these processes. This is Cascadia, and we are Cascadian. Previous ArticleCascadia Culture Week kicks off this week, 13-21! Next ArticleBike Jersey Pre-Order & New Store Items!